What Is SQL and How Is It Used? Structured Query Language (SQL) is the most widely implemented database language, and knowing it is of value to anyone involved in computer programming or who uses databases to collect and organize information. SQL can be used to share and manage data, particularly data that is found in relational database management systems, which include data organized into tables. Multiple files, each containing tables of data, also may be related together by a common field. Using SQL, you can query, update, and reorganize data, as well as create and modify the schema (structure) of a database system and control access to its data. Much of this sounds like information that can be compiled in a spreadsheet, such as Microsoft Excel, but SQL is intended to compile and manage data in much greater volumes. While spreadsheets can become cumbersome with too much information filling too many cells, SQL databases can handle millions, or even billions, of cells of data. Using SQL, you could store data on every client your business ever worked with, from key contacts to details about sales. So, for example, if you wanted to search for every client that spent at least $5,000 with your business over the past decade, an SQL database could retrieve that information for you instantly. Most organizations need someone with SQL knowledge. According to Gooroo, nearly 20,000 such jobs are advertised monthly, and the median salary for a position that requires SQL knowledge is about $84,000, as of 2018. Back-end developer: A person in this position manages the inner workings of web applications, as opposed to a front-end developer, who manages what the application looks like and how it functions for users. Back-end developers work under the floorboards, so to speak, making sure the application is designed and functioning properly. Database administrator (DBA): This is someone who specializes in making sure data is being stored and managed properly and efficiently. Databases are most valuable when they allow users to retrieve desired combinations of data quickly and easily. For that work, someone needs to make sure all data is stored properly. Data analyst: Someone in this position analyzes data, perhaps looking for relevant trends in a particular industry. An analyst might be presented with a particular question and tasked with finding the answer. A simple example might include identifying which clients historically spend the most money on advertising during the third quarter of a fiscal year. That knowledge would allow a sales department to efficiently target clients at the right time. Data scientist: This is a position very similar to that of a data analyst, but data scientists typically are tasked with handling data in far greater volumes and accumulating it at much higher speeds. Common software used for SQL servers includes Oracle's MySQL, perhaps the most popular program for managing SQL databases. MySQL is open-source software, which means it is free to use and is important for web developers because so much of the web and so many applications are built on databases. For example, a music program such as iTunes stores music by artist, song, album, playlist, and more. As a user, you can search for music by any of those parameters and more to find what you're seeking. In order to build an app like that, you need software to manage your SQL database, and that's what MySQL does. In 1969, IBM researcher Edgar F. Codd defined the relational database model, which became the basis for developing the SQL language. This model is built on common pieces of information (or “keys”) being associated with various data. For example, a username might be associated with an actual name and a telephone number. A few years later, IBM began working on a new language for relational database management systems based on Codd’s findings. The language was originally called SEQUEL, or Structured English Query Language. Dubbed System/R, the project went through a few implementations and revisions, and the name of the language changed several times before finally landing on SQL. After beginning testing in 1978, IBM started developing commercial products, including SQL/DS (1981) and DB2 (1983). Other vendors followed suit, announcing their own commercial SQL-based offerings. These included Oracle, which released its first product in 1979, as well as Sybase and Ingres. It typically is easier for beginners to learn SQL than it is for them to pick up programming languages like Java, C++, PHP, or C#. 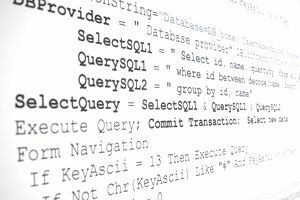 Several online resources—including free tutorials and paid distance learning courses—are available for those who have little programming experience but want to learn SQL. Formal university or community college courses also will provide a deeper understanding of the language. Some of the free tutorials include W3Schools SQL Tutorial, SQLcourse.com, and Codecademy's Learn SQL and a course on analyzing SQL business metrics. Options for paid distance-learning courses include the International Webmasters Association's (IWA) Introduction to SQL (Using Access) or Introduction to SQL (Using MySQL). IWA's SQL courses are only four weeks long, but the presence of instructors and weekly assignments make them more structured than self-learning tutorials. Useful books on SQL for beginners include "SQL: A Beginner's Guide" and "SQL in a Nutshell."